We came to this house with grand ideas of a new fab terrace, firepit, walkway, driveway, deck and lighting! 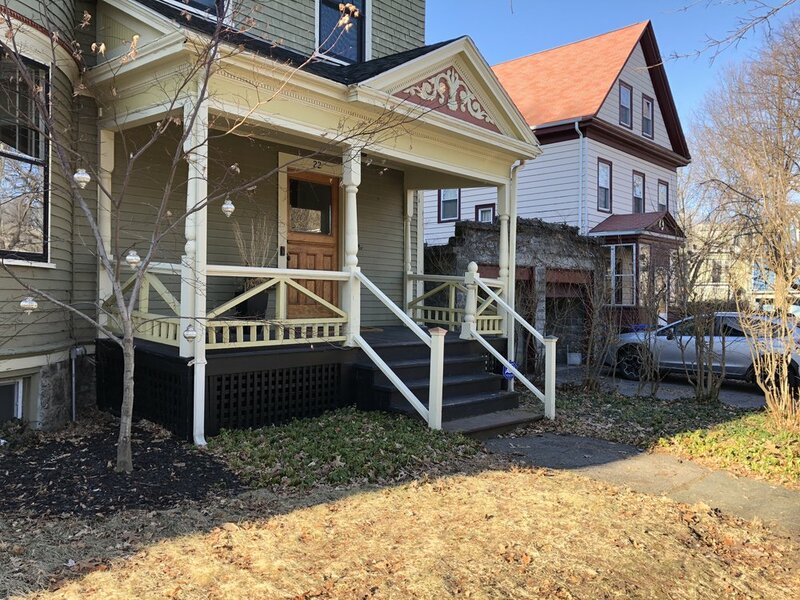 This glorious old Chestnut Hill home has great bones but needs a big update for a new, young family. The owners loved our ideas, but wanted to proceed slowly. Breaking a large project into sizable bites is a great way to go. The more time I spend on a property, I see how a family uses their landscape. We installed a beautiful meandering bluestone and granite pathway and brightened up the doorway with new plantings. Now on to phase two! We took over this property from a "sister" company. They did a beautiful job on the hardscape and custom fountain. We added a lot of plantings to bump up the seasonal color and "secret garden" feel. Last year I had the opportunity to work with a wonderful Needham family. The front of the house was lacking in pizazz and Faithful Flowers has a few ideas to bump up the curb appeal. We built these cute little cheek walls with recessed lights to add some depth to the yard and light the steps at night. Then, we added new plantings including spirea, roses, hydrangea, catmint and shasta daisies for spring, summer and fall blooms. Now this property blooms all season long! We also took down a large storm damaged maple and replaced it with three birches that hug the corner of the lot and are beautifully lit up at night. Stay tuned for the backyard makeover later this month! A few years ago, I had the opportunity to work with a fabulous Brookline designer. Her interior design and landscape won a Boston Home 10th Anniversary award. I hopped out of my truck today to shoot a few photos of how beautifully her garden has grown. It's always great to collaborate with a client with an eye for design! This is the front before we restored the stately entrance. We took our cues from old photos. Linden Street is a little slice of heaven, tucked away behind Brookline Village. Take a walk though this darling neighborhood and step back in time. Our client asked us to create an oasis out of a muddy shaded backyard that was seldom used. We cleaned the old bluestone, took it up, regraded and installed a new footing and relayed it. Then we added a cobble edge to the new plant bed at the fence line and filled it with climbing Hydrangea, Green Spire and Carex grass. We gave the Buddha a sacred spot in a peastone garden complete with Hosta, Bamboo, Aruncus and Tiarella. Stepping stones helped define the shade garden, buffered by plantings of Hosta, Hay Scented Fern, Annabelle hydrangea, Azalea, Bleeding Heart and Astilbe, Solomon Seal and Blue Hydrangea. The Buddha is pleased and so is the client. While the interior of the home was perfection, the exterior needed some big help. We started by replacing the cement walkway with bluestone. Next we redid the foundation plantings and added welcoming front porch containers. 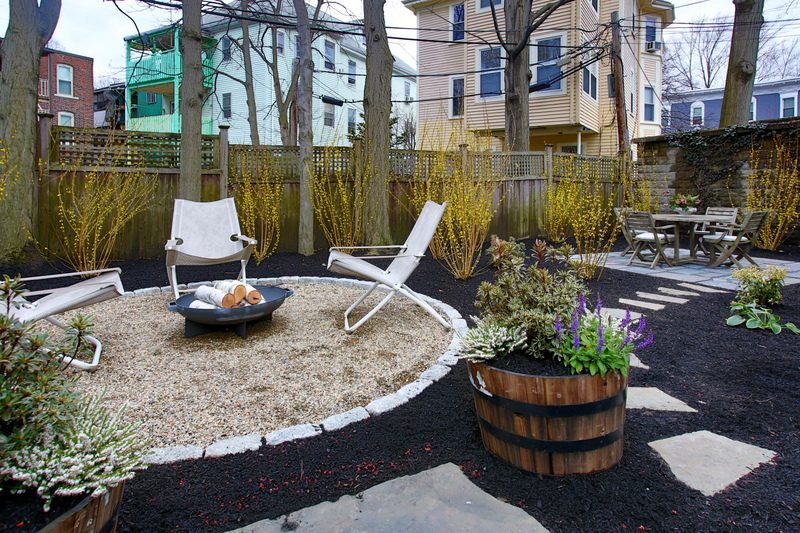 The backyard was the real challenge-we transpformed the mudpit into livable space by repurposing existing stone into a small terrace. Next we added a firepit, stepping stones and blooming forsythia. The outside of the home is now as beautiful as the inside-who could resist? The home was under agreement in a flash! Here is the before photo in 2013. I stopped by a busy intersection in Brookline where I had installed a garden several years ago. The goal was to create somewhat of a buffer between the house and the street and to hide a secret garden for a small child to explore. I was curious as to how the garden held up and if the objective was met. A successful garden should look great as it is planted but also needs to go the distance. What do you think? This cute Brookline cape was hidden behind an old privet hedge, tired foundation plantings and an ugly walkway. Faithful Flowers lightened up the look by removing the privet and adding a handsome iron fence. We installed a bluestone walkway to match the existing steps and year round blooming foundation plantings. Welcome home!!!! My longtime customers sold their large beautiful home and downsized to a historic condo. They had a small space in the backyard dedicated to a terrace area. Unfortunately, it looked like this...a sad slab of concrete. Not an appealing area to relax after a long day at work. The first thing we did was to create an inspirational drawing that enlarged the entertaining space and ringed the terrace with plantings to create the effect of being inside the garden. Given the green light, we demolished the old concrete slab and installed Unilock pavers to keep costs down and to match existing onsite pavers. The result, a quiet retreat hugged by hydrangea, shasta daisies, sedum, catmint, grasses and knockout roses. Something is blooming all year long! The turkeys challenged our photographer Peggy Stander for territory! Now you know why this terrace is really for turkeys! 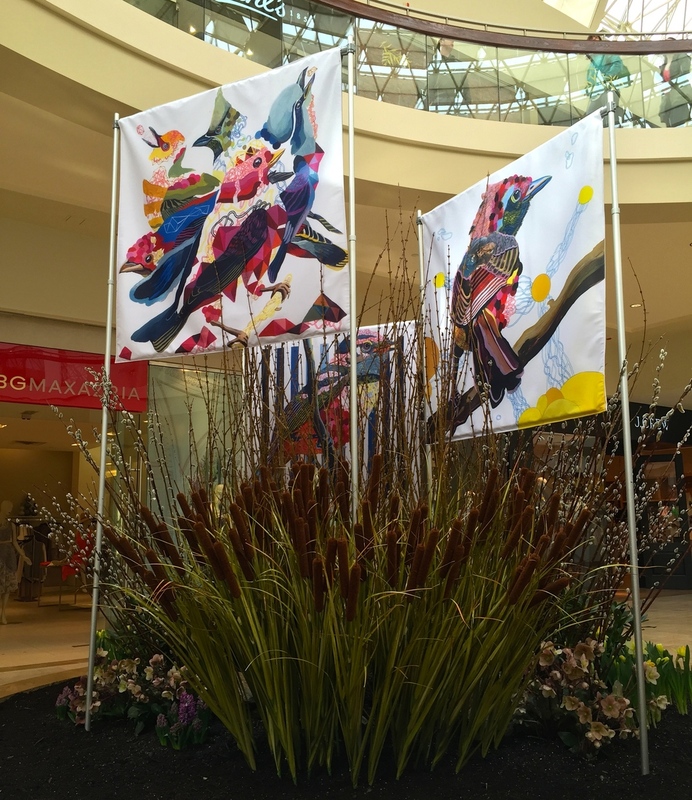 Faithful Flowers displays work year round in center court at the Mall at Chestnut Hill, but spring is always a special time. This season, I teamed up with Ken Dietz, principal of the interior design firm Dietz and Associates (http://www.dietzandassociates.com). Ken and I often collaborate as he designs fresh and modern interiors which I translate outside into the landscape and natural world. I have been thinking about the young contemporary artist, Juan Travieso (juantravieso.format.com) whose work reflects his environmental concerns. I am quite taken with his paintings of deconstructed birds and apparently so are many collectors and museums. I suggested to Ken, that I would like to include Juan's work in the project. With that in mind, Ken and I created an installation featuring Juan's birds combined with elements of an awakening spring New England landscape. See how we took the plan from start to finish. Thank you Juan for sharing your work and Ken for your impeccable design and eye! When we finished building fashion designer Sarah Campbell's firepit, I felt a strange thing....I was jealous of the beautiful intimate space we had created in her new garden. Why couldn't I have something like that? My backyard was a true testament to the "cobbler's children who have no shoes" story. It was ugly and embarrassing. We all work so hard March through November that there is no time to spruce up our own landscape. I decided at that moment to make the time, and with the help of my fabulous crew and input from my good friend Ken Dietz of Dietz Associates, my own backyard dream came true! Sky Pencils surround the peastone and cobble interior. They will soon hide the space and create a new room in my small backyard. The bluestone cap is perfect to place a drink or to put your feet up! Room and Board folding oversized folding chairs are great for relaxing in. A hidden fountain provides a soothing sound. Hydrangeas, a Japanese Maple and a spectacular variegated weeping dogwood give me plenty to meditate on while I enjoy a cold glass of wine after a long, hot day of work. I always wanted a cutting garden, so I added one next to the fence. Eric helped me remove a huge old stump that had impeded anything growing there! Now I can enjoy my flowers inside and out! Thanks to the best masons in the world-Luiz and Lucas Netto. Crew chief Brandy Mirth and the crew... Eric Joy, Neil Demarco, Max Doyle and Tayler Stander. The condo owners had their garden destroyed when important repairs were made to the building. It's a busy intersection in Brookline and a very visible one. Over a year passed before the garden could be restored and the neighbors were delighted. 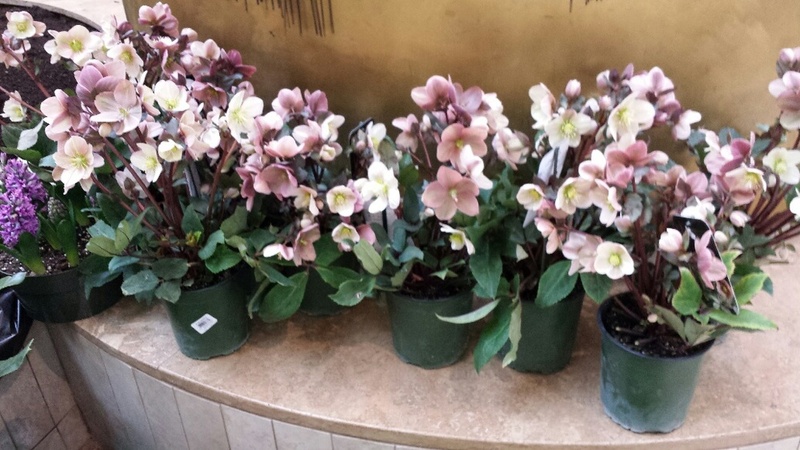 Every day the Faithful Flowers team was on site, we were showered with compliments! 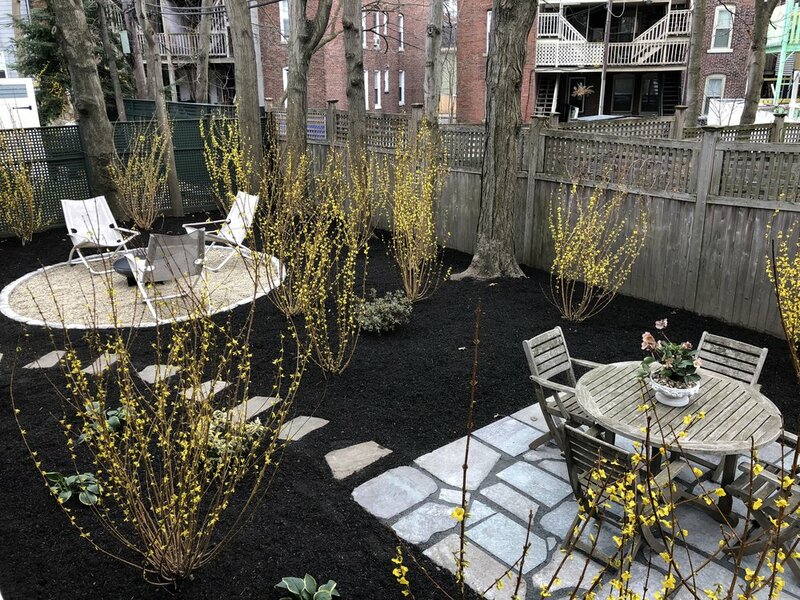 We added a Venus Dogwood for the whole neighborhood to enjoy while providing a privacy screen for the owners with spring blooming Forsythia. The air conditioning units will soon be invisible thanks to fast growing sun loving grasses and non-deciduous Andromeda. We perked us both entrances to make coming home each day feel great. Here are plenty of before and afters to see the big change to the neighborhood! Number four on clothing designer Sara Campbell’s summer bucket list was to plant a garden. After selling off a chunk of her and her husband Ken's large backyard, they found themselves staring through the kitchen windows, at a very large new house and fence. Sara was devastated that the builder had ripped out her roses, hydrangea, Japanese Maple, and broken the wings off her beautiful stone angel. Ken was determined to make it right. After many design meetings with the couple, the Faithful Flowers team set to work. Faithful Flowers, remembered what the garden had looked like. The goal was to bring back the best parts. We sourced an amazing Viridis Japanese Maple to serve as a focal point, and covered the fence with an evergreen screen. We then built a new bluestone firepit and surrounded it with lovely Blue Hydrangeas, Hostas, Astilbe and ferns. Sara even got a mini birch grove and a nook to grow her pale pink heirloom roses. Ken got his wish of more greenspace to view and for his dogs to run. The broken Angel was returned to a special place in the new garden next to the Japanese maple and weeping Katsura. Beautiful photos courtesy of Peggy Stander. A very quick before and after of a firepit we'd all like to have in our backyard! Thank you Luiz and Lucas Netto for your craftsmanship! The front portion of Chestnut Hill Bauhaus is almost finished and it's a stunner. 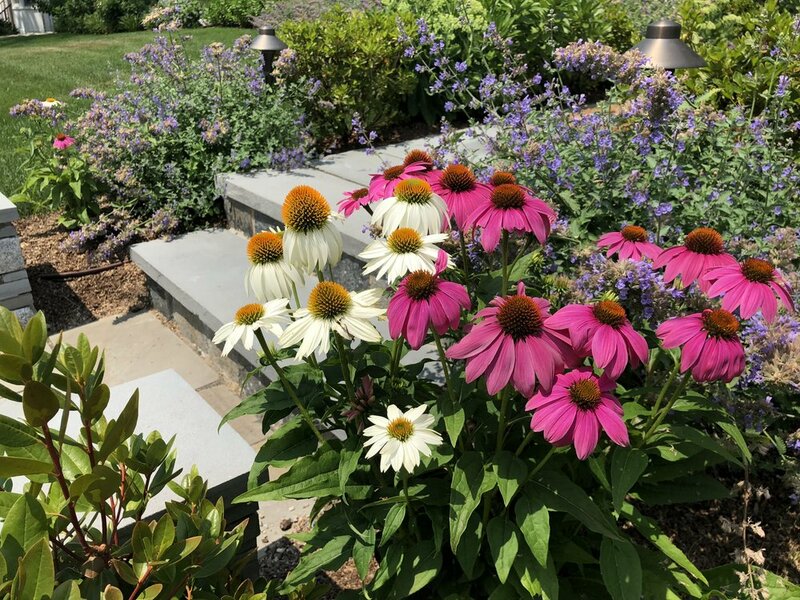 The haphazard flagstone walkway was replaced by a beautiful bluestone walkway that takes visitors past a lush meadow, newly planted dogwoods, birches, a small Asian inspired garden right to the front door. We maintained the Bauhaus tradition of clean, simple lines tied back to the land, to stay true to this historic property. It was another frigid January day when the management at the Mall at Chestnut Hill called me and asked if I would participate in their spring flower show. I knew it was a big commitment and a lot of work, but I decided to give it a shot. It might be fun and after the brutal winter, we all needed a colorful, floral infusion. I was offered a prime space in the center court. See the "BEFORE" photo below. I signed on and immediately picked up the phone and called my friend Ken Dietz(http://www.dietzandassociates.com.) Ken is a well known interior designer and we often collaborate on projects. While he designs the home's interior, I translate his themes and colors into the exterior landscape. We had a meeting or two at the Mall and threw around a couple of ideas. Center court BEFORE the work begins. It was looking like a traditional garden until I brought my design partner and Landscape Architect, Steve Woods into the picture. Steve took all our elements, and designed a modern,clean, simple space with waves of bold colors. It was important to Steve to integrate the existing bronze sculpture into the plan. He did this by adding a tree at the top of a small hill so it would appear that the sculpture of the girl was peering into it. I found my tree and plant material on a snowy cold March day at the wholesale nursery. It felt great to be inside the colorful, oxygen rich greenhouse. 6PM the Mall closed and the team transported the delicate plant material, two yards of loam, water features and supplies through the unusually cold temps and into the mall. The center court is prepped and ready to go! After we prepping the entire area, I brought in my friends from TMturfscapes.com. It was too early to install sod, and I really wanted to showcase Turfscapes amazing products. They sell a variety of artificial turf that actually looks like a real lawn. I told them I wanted my personal favorite, the product with the "dead" pieces of grass woven in! Some backyards are just too shady to grow grass. Turfscapes can install this product on roofs, decks, patios and lawns and it looks green and great all year long! Finishing touches on the lawn. Next, we wired silk dogwood flowers into the Crepe Myrtle tree and added clear Edison bulbs. The combination of live plant and silks produced a convincing "blooming" tree! Ken Dietz and Elaine Shannon wiring the tree. Now it was time to add all the plant material and set the water features. In progress... Elaine Shannon, Pepe Diego, and Faith Michaels. Just past one in the morning the project is completed. When the Mall opened in the morning, It was fun to watch the public enjoy this burst of spring we have all been starved for! Here's a garden lover bringing some images home! What once was a hard to negotiate flagstone walkway, is now a modern pathway to the front door. Luiz and Lucas built over 60' of bluestone landings and steps to gently climb the very steep incline. Once the vegetation, plantings and lighting goes in next year it will blend seamlessly with the historic "modern" 1950's home. Best of all we beat the ground freeze! Luiz is happy to finish the season! The team has been working seven days a week to install the 63' long walkway before the ground freezes and our masonry season is over. We made a lot of progress and it's starting to look amazing! Bluestone was turned on edge to tie the walkway to the home's modern roots. Footings were built and the 7 bluestone treads installed. Each stone has been handpicked for color and texture. Luiz places each stone with thought and care for the overall design. Polymeric sand will be added to seal the joints. MORE TO COME! Back in the nineteen fifties, the time of the three martini lunch and Don Draper suiting, "Modern" homes were all the rage. Architect Walter Gropius, founder of the Bauhaus movement, built his own modern home right here in Concord Massachusetts. His friend, Walter Bogner, Dean of the Harvard Architecture School designed this home in 1956 in the Modern style championed by Gropius. Listed in the National Historic Registry, the home bears hallmarks of the Bauhaus movement. The structure has an open floor plan with sleek fluid lines and soaring floor to ceiling windows that bring the outside in. 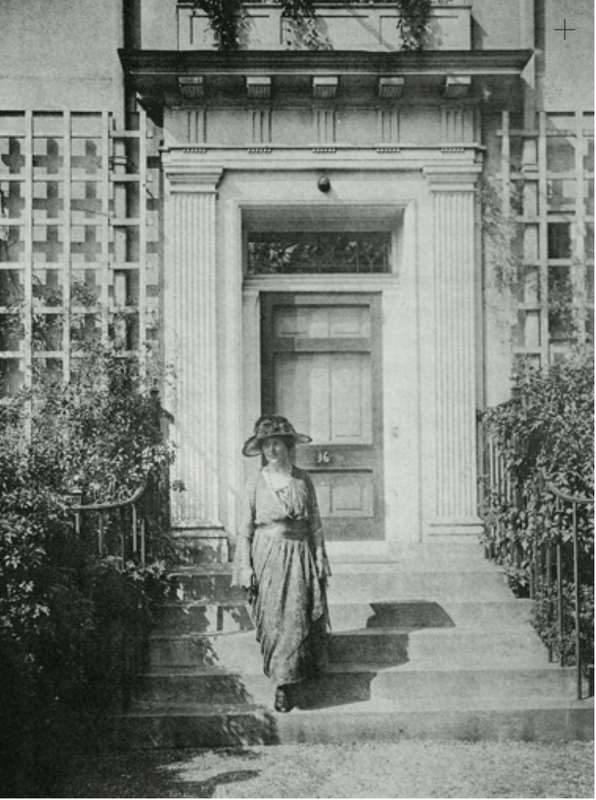 The only problem was that the home had not been lived in for almost twenty years and the outside had literally taken over. The other pressing issue was that there was no really front walkway to the house. Our clients wanted to be able to safely navigate the front walk in the coming winter. FF Landscape Architect, Steve Woods designed a walkway that moved closer to the house and reflected the angles of the building itself. Luiz and Lucas went to work building steps to match the original bluestone landing and sourcing stone to match an existing wall and to use on the risers. The work is well underway. We will keep you posted!